New Delhi: India's World Cup cricket hero Yuvraj Singh announced on Sunday that he has been discharged from hospital after undergoing chemotherapy for a cancerous tumour. 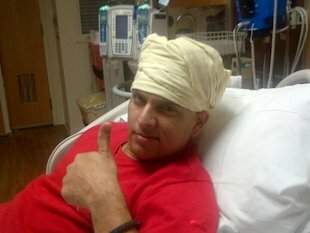 Yuvraj Singh during his cancer treatment in Boston. "3rd chemo cycles over, back from hospital n I am free....Can't wait to be back home," the 30-year-old all-rounder said via Twitter from the United States, where he has been receiving treatment. Left-handed Yuvraj, named man of the tournament after India's World Cup triumph at home last April, was diagnosed with a rare condition, mediastinal seminoma - a malignant tumour between his lungs - soon after the event. Thousands of well-wishers, including US cycling great Lance Armstrong, have sent messages to the player, who is known for his aggressive batting and disciplined spin bowling. Thanking fans for their support, Yuvraj also doffed his hat to Indian cricketing superstar Sachin Tendulkar for achieving the "unachievable" after becoming the only player to score 100 international centuries on Friday. "Overwhelmed and full of emotions Tendulkar take a bow What he has achieved is immeasurable and what he has done is unachievable," he said. Yuvraj, who scored 362 runs and bagged 15 wickets in nine World Cup matches, has not played competitive cricket since taking part in two of the three home Tests against the West Indies in November. He has scored 8,051 runs in 274 one-dayers and 1,775 in 37 Tests since making his international debut in 2000.